Coursing its way through stone walls that it has shaped, the Delaware River defines the common borders of New Jersey and Pennsylvania. This great river connects cities and open land, bringing fresh water to urban populations while creating bucolic places for exurbanites to reconnect with the land. Just above New Hope, Pennsylvania, the river makes a marked bend; the north/south path of the river shifts to an east/west trajectory, before returning to it’s prior alignment. The site for this residence is sited precisely at this bend. It is a steeply sloping bluff overlooking the River, allowing for long views down the river in two directions. The approach to the house winds through farms and homesteads, eventually crossing an open meadow. The path dips into the heavily wooded slopes to a precipitous overlook before finally turning towards the residence, entering an intimate court framed by rough hewn rock. The house opens to the river with glass expanses along the length of its northern face. On southern and western exposures, the home is sheltered from the sun and with stone walls, deep overhangs, and a cantilevered canopy at the entrance. Within the house, a central pavilion collects living, dining, kitchen, and gallery areas. Sheathed with glass on all four sides, it rises on eight steel columns to a wafer-thin roof line and deep overhangs. Adjoining the pavilion on one side is a pivot of the residence—the greeting room. It is an intimate yet public space, a point where entertainment and repose intersect. Encased in zinc, this conical room incorporates fireplace flues into its sculpted shape. Twisting outward from this space is the more secluded office and master bedroom wing, including an indoor lap pool and exercise area. Between the sloping zinc roof of the pool and the master suite is a sky lit gallery and dressing area. A roof of meadow grasses brackets the other side of the pavilion and includes guest quarters, service spaces, and garages. 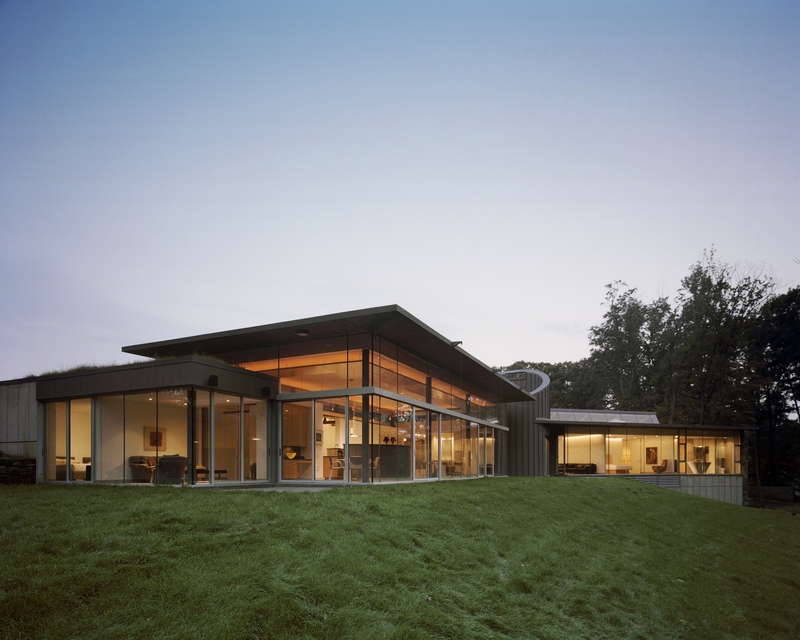 All of these spaces are tucked into the existing slope of the site, extending the blanket of grasses across the roof and stitching the home into the meadow beyond. Principal exterior wall surfaces are formed of stone quarried on-site, along with other locally quarried stone, architectural cast-in-place concrete, and glass. Local bluestone grounds the glass walls at the sill, and stretches out horizontally at terraces and walkways. Interior flooring is limestone throughout, complimented by English Sycamore millwork and solid stone countertops. Kanter Residence. North elevation, overlooking the Delaware River. Photo by Albert Vecerka | ESTO. Meadow Extension over Roof. Photo by Peter C. Cook. Living Pavilion + Gallery. Photo by Albert Vecerka | ESTO. Living + Dining. Photo by Albert Vecerka | ESTO. Kitchen. Photo by Albert Vecerka | ESTO. Master Bath. Photo by Albert Vecerka | ESTO. Master Dressing Area. Photo by Albert Vecerka | ESTO. Motorcourt + Entry. Photo by Albert Vecerka | ESTO. South Elevation. Photo by Albert Vecerka | ESTO. Floor Plan. Image: Bradley Walters. Exterior Elevations. Image: Bradley Walters. Architect: RMJM (formerly Hillier Architecture), 500 Alexander Park, Princeton, NJ 08543-6395 | Tel. 609.452.8888 | Fax.609.452.8332 | www.rmjm.com. Principal-in-Charge + Lead Designer: J. Robert Hillier; Designer + Project Architect + Project Manager: Bradley Walters; Senior Technical Architect: Gabe Czako; Landscape Architecture: Janet Garwood; Interiors: Kimberly Mackenzie; Furniture: Royce Espstein; Custom Furniture: Jose Atienza; Glass Guardrails: Jennifer Akerman; Custom Kitchen Bins + Front Entry Gate: Meredith Bostwick-Lorenzo Eiroa; Delineators: Erika Weidner + Matt Baab. Structural Engineer: Harrison-Hamnett, P.C. | www.hhpccse.com. Principal-in-Charge: John Harrison; Project Team: Mark Gaffney, Bill Bocchieri, Craig M. Block. Mechanical/Electrical/Plumbing/Swimming Pool Engineers: Syska Hennessy Associates (formerly Caretsky Associates) | www.syska.com. Principal-in-Charge: William (Bill) Caretsky; Project Manager: Al Stahl; HVAC: Ray Roldan; Plumbing: Bob Suglia. Civil Engineer: Showalter & Associates | www.rlshowalter.com. Project Team: Bob Showalter, Mark Snyder. Soils + Geotechnical Engineers: DelVal Soil & Environmental Consultants. Project Team: Dan McFarlane, Stephen C. Yates (septic/well), Bill Palkovics (structural borings). General Contractor: Gordon H. Baver, Inc. | http://gordonhbaverinc.com. Principal-in-Charge: David G. Baver; Site Superintendent: John Sevey. Auman, Melissa. “Embracing Nature.” Solutions at Hand Philadelphia, April 2007, pp. 24-29. McNamara, Gwen. “A Home With a View: The House at Leeside Farm.” Inside Central New Jersey, August 2006, pp. 22-25. Berschler, Susan Pevaroff. “Empty Nesters’ Hillside Haven is a Natural High.” Home & Design, The Philadelphia Inquirer, NJ Edition. April 2006, cover and pages 10-15. Harper, Rebecca. “House of Glass,” Philadelphia Style, Volume 7, Number 6, November/December 2005. Allegra, Mike, “The New Home Ec.” Lawrentian. Volume 69, Number 3, Fall 2005. Schipper, K. “A Home With Its Own Stone,” Stone Business Magazine, December 2004. Heavens, Alan J., “Landscape Masterpiece,” Philadelphia Inquirer. Sunday, 19 September 2004. Henderson, Tina. “Mindful Living and the Nourishment of Zen Design.” BUCKS: The Art + Culture + Lifestyle Magazine. Volume 2, No. 2, March/April 2004, pp. 54-60.